More than likely disintegrated. The sad part is, this type of accident normally dont leave any survivors. Hope the authority investigate this accident thoroughly and make amends to prevent this kind of accident from happening again. Airspeed indicator damaged on its last four flights and still they let it fly. The authorities need to do something with Lion Air. Highest incident and accident recorded in Indonesia. I hope their management and operations have nothing to do with Malindo? Malindo is overseen by DCA/Mavcom - so they have to comply with Malaysian civil aviation regulations. However, their aircraft is owned by the parent company - I am not sure what kind of maintenance arrangements they have. But it has been known that some Malindo aircraft do go for some work to be done at Batam. I don't think this is a fair representation of Lion Air's record. Prior to this, their last fatal accident was in 2004. And all of their incidents are fairly common occurrence among airlines all over the world, including here in Malaysia. I think it's more to do with near misses and poor management. "However, it has struggled with issues of safety and poor management and was banned, along with other Indonesian airlines, from flying into European airspace until 2016. Its first deadly accident in 2004 saw 26 people killed and more than 100 injured when a Lion Air plane skidded at an airport in the central Java city of Solo, with the airline blaming bad weather and strong tailwinds. In 2013, a rookie pilot at the controls of a Lion Air plane undershot the runway and landed in the sea off Bali, splitting the plane in two and forcing passengers to swim to safety. Remarkably no one was killed in the accident. Three years later, two Lion Air passenger planes clipped wings as they were about to take off from Jakarta’s main Soekarno-Hatta airport." It is also premature to blame Lion Air in this case as the cause of the crash is still to be determined. past four flights recorded similiar issue on the airspeed indicator, maybe there's some improvement opportunity in the service guidance. may it be Lion's aircraft service SOP, or Boeing technical service handbook. Didn't they just have another minor accident? One of their B737-900ER had just had its Winglet scraped through a lamp post? Yes, but people should not get into a tizzy over it. These things happen all over the world and are quite normal. There isn't a need to sensationalise them. Lately, there were quite a number of ground collisions too - at first world airports involving first world airlines. Human beings operating equipment will always make human errors. Our hope is that these errors do not become serious and fatal and the aviation industry does it best to minimise them. Edited by flee, 08 November 2018 - 11:16 PM. JAKARTA, Indonesia The government safety inspector had spent all night at the Makassar airport, in eastern Indonesia, several years ago, poring over a Lion Air jet that had suffered a hydraulic failure. Telling airline employees that the plane was to be grounded until the problem was fixed, the inspector went back to a hotel for a quick shower. When the inspector returned, the plane was on the runway, about to take off. Furious, the inspector demanded that the passengers disembark. But a supervisor with Lion Air explained how the airline had gone over the inspectors head: Federal transportation officials in Jakarta, the Indonesian capital, had given permission for takeoff, the inspector said. The plane was in the air minutes later. Investigators and experts are uncertain why Lion Air Flight 610 plummeted into the Java Sea last month, killing all 189 people on board. But they are focusing on an automatic system designed to keep the plane, a Boeing 737 Max 8, from going into a stall condition. A stall can occur when the planes nose points upward at too great an angle, robbing the craft of the aerodynamic lift that allows it to stay aloft. But if the 737 receives incorrect data on the angle as the same plane did on the flight just before the crash the system designed to save the plane can instead force the nose down, potentially sending it into a fatal dive. 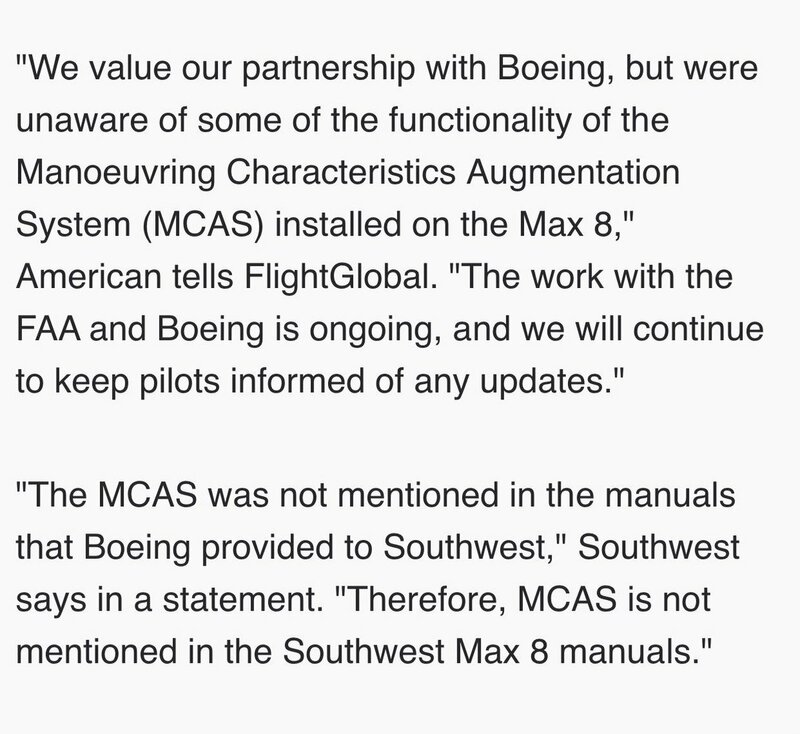 The situation in this case is further complicated by Boeings installation of the system, which the company did without explaining it in the new models operating manual. So the pilots might well have been unfamiliar with it. IMHO, Lion Air still has to take a major share of the blame for putting an unserviceable aircraft into service.